With the announcement of the new Raicho, I was thinking I actually wanted to jump ship and start reviewing Morats. Sticking to my guns though, I'm going to keep moving forward with Ikari, but I still get to review a Morat unit! 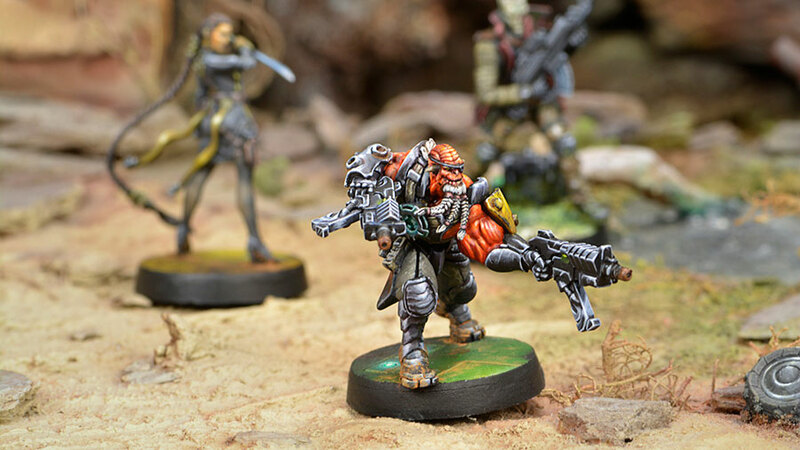 The Krakot Renegades are escaped penal legions, who have quickly found their place in the Human Sphere, selling out to anyone that will give them a buck to break some heads. Without a doubt, the Krakot is designed to get into melee and punch heads. All of his exceptional stats and special rules are geared towards getting into combat quickly (between MetaChemistry and Forward Deployment), and to make sure when he gets there, he kills whatever he needs. The Krakot is both Regular and (normal) Impetuous, allowing it to be much more of a team player than many Warbands. Berserk is another useful tool, though it does turn the Krakot into a bit of a one-hit-wonder, turning close combat into a Normal roll, but boosting him to CC27. Having berserk also gives you Assault, letting him move 8" and still get a swing in at CC18. Really, any roll except 1-4 is going to go a long way on this profile. Dogged + Total Immunity is pretty obvious, making the Krakot much more difficult to take down before it's able to deal a ton of damage. My favorite however are the movement enhancements, which makes him more efficient to get across the board. The bonus to PH and Regeneration however can be the most devastating when you get it on the Grenades profile. Red Fury, Chest Mine. While being the most firepower you can get on a Krakot, this profile doesn't really seem to play to his strengths, and is quite expensive compared to the others. With only BS11 and the inability to claim cover due to Impetuous, you're really relying on your burst to carry this profile. Submachine Gun, Chest Mine. A more up-close fighter than the Red Fury, carrying a Submachine Gun and Chest Mine means when you're up close you can either deliver a direct template weapon or a fist full of AP/Shock shots. This is a solid go-to profile in my experience, and it's even helpful to go Suppressive from time to time, being regular impetuous means you can cancel the extra order for free, so you won't drop Suppressive if you don't want to. 2 Chain Rifles, Grenades. This is my first choice in Krakot profiles. A burst 2 Chain Rifle can cover a wide area, or force the opponent's hand when choosing to dodge or shoot back. On top of that, carrying grenades with an impressive PH13 lets you play with a bit of spec firing, not to mention if you end up being PH16. The only downside here is lacking the chest mines, though your direct template needs are well covered already. Boarding Shotgun, Chest Mine. If you're looking to spend a few more points to give your Krakot some firepower, this is a very solid option. The +6 modifier up close helps make up for the Krakot's weak BS, and having an Impact template is fun when your Krakot ends up fast enough to get around the side/rear of an opponent. 2 Submachine Guns, Chest Mine. If the Submachine Gun profile was piquing your interest, then how does two submachine guns make you feel? If you have the two points to spare, this is a worthwhile upgrade, improving you to B4, which is like having an assault pistol, but with special ammo, and better long range. I take a Krakot just about whenever I can, and often as many as possible (1 in Ikari, 2 in most vanilla factions, 3 in Morats). Metachemistry can really boost their effectiveness, regardless of the roll (except maybe +1 ARM and Bioimmunity), even if you roll 6-4 Climbing Plus, being regular Impetious means you can cancel the Impetuous order for free if the move would put you in harms way. Forward Deployment helps the Krakot set up in a good position, and when combined with a movement enhancement from MetaChemistry, this guy can be deceptively fast. All that said, they ultimately function much like any other warband, moving up the table, and delivering a template weapon into the vulnerable units in the enemy force. They just happen to be very, very good at their job.